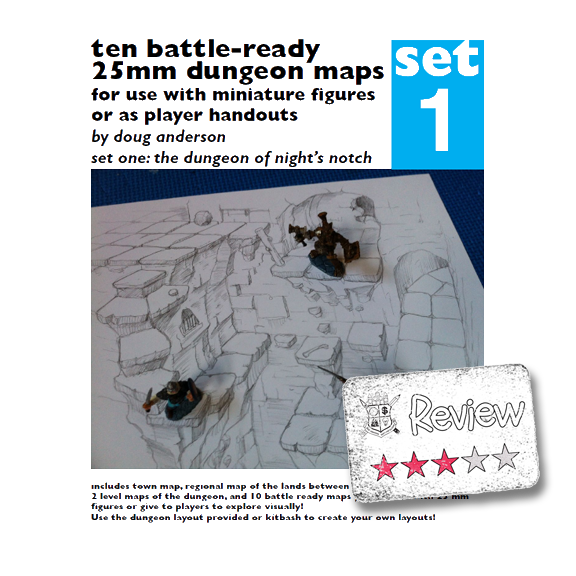 This review of Blue Boxer Rebellion's 1st set of "Ten battle-ready 25mm dungeon maps" was a bit more difficult for me than I had expected. First off, I thought this map set had a huge "WOW" factor and it is still pretty cool. Unfortunately the set falls just a little short of anticipation and while still a good series of maps, there are a few touches that could make it great. As an aside, the second set just came out and it looks like at least one concern of mine from this set had already been taken care of. The letter-sized PDF file is 20 pages long and a whopping 71.4 MB is size. 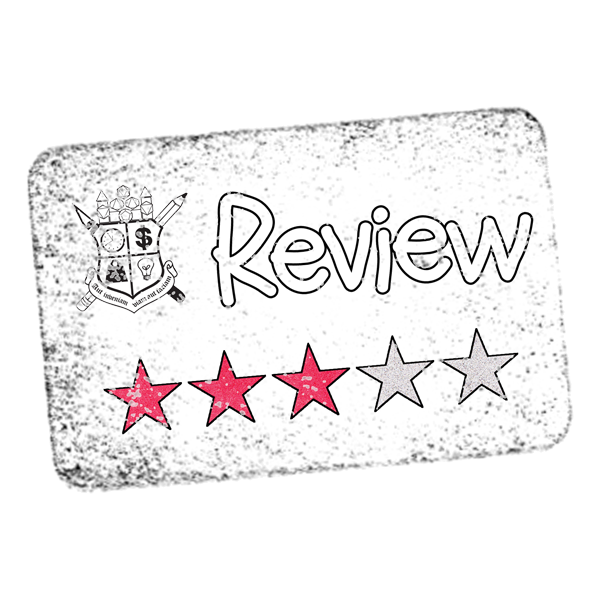 It starts off with a cover and introductory page, some of which I will inevitably cover in a later post (in other words some great freebies! ), and the next page is a series of thumbnails. I really appreciated the thumbnail page and think more people need to include these in their map packs. The PDF then starts getting into the good stuff. There is a town map, region map, and then an overall dungeon map (separated into two parts), all with labels. None of these maps are "battle ready" and while you pretty much need the overall dungeon map, the town and region maps are pure bonus. There are technically 11 "battle ready" maps, with one map shown twice with different options on each page. The PDF rounds out with two more "duplicate" maps, the region and town, without any labels. The last page is a series of notes on each "battle-ready" map. .....and the resulting page was a bit more than "OK". My print of page 7 (Room 1) is definitely usable, but quite a bit lighter than expected. This is where things seem to fall a bit short. I would have preferred a much darker print with higher contrast so everything will be easier for my players to see. There were some unnecessary graphics added to most of the pages, this one included. I don't need arrows and labels pointing out tunnels, nor do I need dashed lines showing where players could jump from point to point. 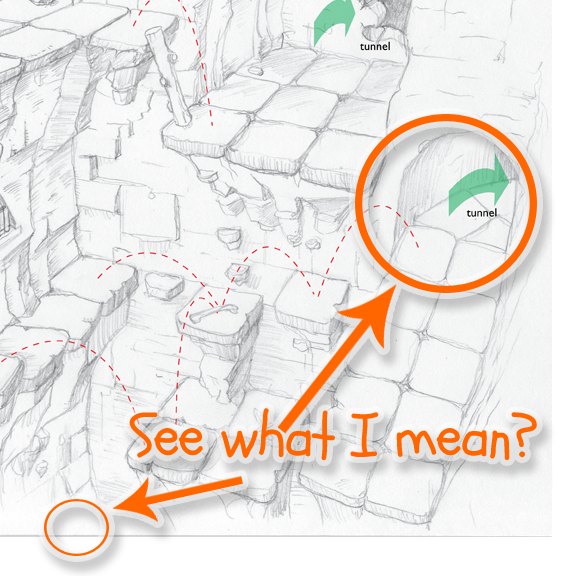 The art, not to mention the overall dungeon map, does a great job showing the relationships within and between map sections. If you think you need to put all this extraneous information on the pages, then put them on a layer so people can simply choose to deselect that layer and print the map without it. On my print out you can also see the edges of the paper the sketches were originally made on and you can tell that the original sketch was scanned into a computer and edited somewhat.. Ugh.....this is really unforgivable in my opinion. If you are going to do any editing in Photoshop or the like, removing the scanned edges is one of the first things you should do. If, as an end user you want to take a crack at fixing these things with the map in Photoshop.....probably not going to happen because the file is secured. Finally, I wish this was a bit larger than 25mm. This is a minor quibble, but with more and more minis coming in at 28 or even 30 mm, I think a 28mm scale would better accommodate a larger range of minis. Of course it would be easy enough to have a printshop print this at a slightly larger scale on 11x14 paper. Overall, for $2.50 it isn't a bad set of maps and with a few tweaks could be a really great old-school map set to use for an adventure. I think more than anything this 1st set hints at some great potential, some of which I can already tell has been unlocked in set 2.